BERLIN - It seemed like there was more arguing on the pitch than actual soccer during Saturday’s Nutmeg Games 18U girls soccer tournament. 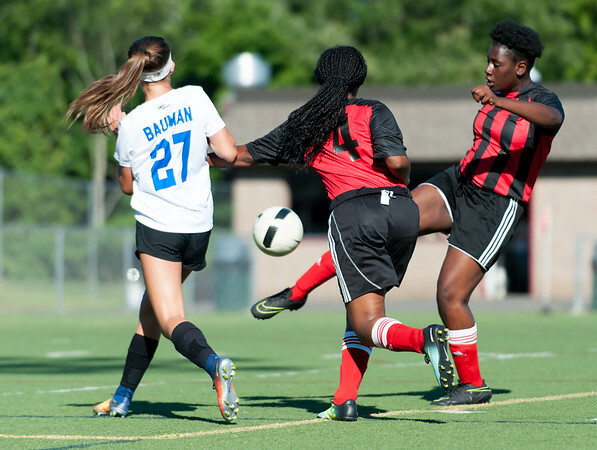 Tensions rose early and often as the Elite Nation FC of New Britain questioned many of the calls made by the referees during its match against the West Haven Blue Devils at Sage Park, one that resulted in a 4-0 loss. It all started with an incident involving Elite Nation’s Allyson Kerr. The forward had been playing with long braids with wooden beads in her hair since the competition began earlier this week. But when one of the Blue Devils was hit in the face, West Haven coach Wayne Valajitis brought it to the refs’ attention solely for safety purposes. Kerr and the rest of New Britain did not understand what the problem was, especially since she had been playing all week without an issue. But the beads in the hair wasn’t the only issue. Elite Nation believed many of the calls on the field were poor, including an offsides call which negated the team’s lone goal after West Haven had scored twice in the second half to make it 4-0. When running events, the Nutmeg staff always tries to make decisions in the best interest of the players and the players safety. When things seemed to be getting out of hand, an event director was called to the field to ensure the Games continued on smoothly. Although the focus was on more than just the play on the field, New Britain still had positive takeaways from the match and the tournament..
Posted in New Britain Herald, New Britain on Saturday, 21 July 2018 20:12. Updated: Monday, 23 July 2018 16:34.